Every style of music uses major chords - for many players, the first thing they learn is a handful of these essential shapes. 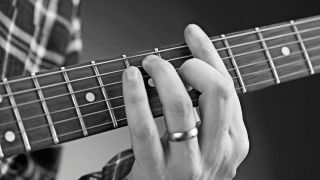 Still, once you get ‘under the hood’ there’s a lot to learn, and it’s not always confined to rhythm playing either; breaking chords down into individual notes is also great for folky fingerstyle and melodic lead solos. Last month, we looked at the structure of the major scale and this information will help you understand major chords because they are built from three notes of this vital scale. Read on as we break it down for you. Major chords (such as C, D, A, and so on) comprise just three notes: the first, third and fifth notes from their major scales. So, a C major chord uses C, E and G notes. Play through the scale, then, to work out the notes of the chord, play the 1st, 3rd and 5th notes (C, E and G). Try moving down a fret to work out the notes of B major. Learning chord notes from the scale we've just looked at has one problem: the 3rd and 5th intervals are on the same string, so can’t be played at the same time. Obviously you need to use three strings if you want to play a chord. We’ve arranged the C, E and G notes into a chord here, played with a simple Ed Sheeran-esque rhythm. When played as a three-note shape with the notes , it is called a ‘triad’. A lot of chords have more than three notes. No surprises there - the guitar has six strings, after all. As long as you play a mixture of the first, third and fifth notes (usually with the root as the lowest note) then it is a major chord. This simple strummed rhythm is based on an open C chord. There are five notes in the open C - a mixture of the crucial first, third and fifth C, E and G notes.